Wood Designs' best-selling Tip-Me-Not™ Deluxe Play Kitchen is designed with safety in mind. Kids will love the extra shelf space provided by this Tip-Me-Not™ Hutch. Arrange spices on the shelves, or line up cups in a straight row. The large top surface is perfect for preparing food or organizing kitchen items. Open the double doors for more storage. Rounded door handles and continuous hinges prevent pinched fingers and allow doors to open wide enough to lay flat against the side. 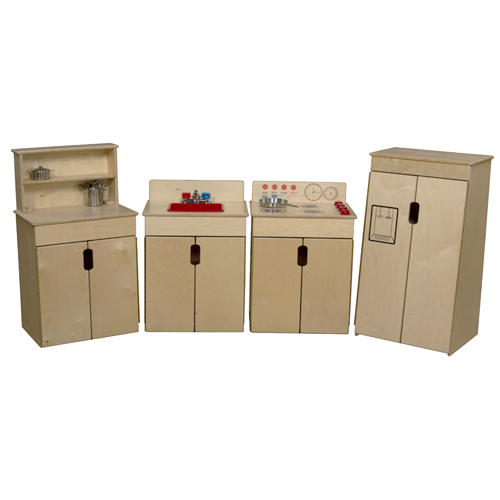 The hutch is constructed with Healthy Kids™ plywood and coated with GREENGUARD® certified Tuff-Gloss™ UV finish for a durable and healthy learning environment. Wood Designs' Tip-Me-Not™ Deluxe Play Kitchen Hutch features a low center of gravity to increase stability and resist tipping, keeping kids safe. Wood Designs' best-selling Tip-Me-Not™ Deluxe Play Kitchen is designed with safety in mind. Keep food and drinks "cold" in this Tip-Me-Not™ Refrigerator. Imagination soars as kids fill glasses with water and ice from the built-in "dispenser." Open the tall double doors to access the food inside. Rounded door handles and continuous hinges prevent pinched fingers and allow doors to open wide enough to lay flat against the side. The refrigerator is constructed with Healthy Kids™ plywood and coated with GREENGUARD® certified Tuff-Gloss™ UV finish for a durable and healthy learning environment. Wood Designs' Tip-Me-Not™ Deluxe Play Kitchen Refrigerator features a low center of gravity to increase stability and resist tipping, keeping kids safe. Wood Designs' best-selling Tip-Me-Not™ Deluxe Play Kitchen is designed with safety in mind. Kids will enjoy "washing" their hands, dishes and anything else they can find in this Tip-Me-Not™ Sink with movable knobs. Imagining is easy with the spacious plastic sink tray. Store extra kitchen items in the cabinet beneath the sink. Rounded door handles and continuous hinges prevent pinched fingers and allow doors to open wide enough to lay flat against the side. The sink is constructed with Healthy Kids™ plywood and coated with GREENGUARD® certified Tuff-Gloss™ UV finish for a durable and healthy learning environment. Wood Designs' Tip-Me-Not™ Deluxe Play Kitchen Sink features a low center of gravity to increase stability and resist tipping, keeping kids safe. Wood Designs' best-selling Tip-Me-Not™ Deluxe Play Kitchen is designed with safety in mind. Little chefs will love this Tip-Me-Not™ Stove with four black burners and four movable control knobs. The double doors open to create a pretend oven, or use the cabinet space for extra storage. Rounded door handles and continuous hinges prevent pinched fingers and allow doors to open wide enough to lay flat against the side. The stove is constructed with Healthy Kids™ plywood and coated with GREENGUARD® certified Tuff-Gloss™ UV finish for a durable and healthy learning environment. Wood Designs' Tip-Me-Not™ Deluxe Play Kitchen Stove features a low center of gravity to increase stability and resist tipping, keeping kids safe. This best-selling Tip-Me-Not™ Deluxe Play Kitchen from Wood Designs is designed with safety in mind. Rounded handles and continuous hinges prevent pinched fingers and allow doors to open wide enough to lay flat against the side. Perfect for a daycare or preschool setting, Tip-Me-Not™ appliances feature a low center of gravity to increase stability and resist tipping. At SCHOOLSin, there's only one thing we love more than preschool furniture and daycare furniture - making our customers happy. So if you have any questions about our play kitchens, give us a call at (877) 839-3330. A member of our friendly customer service team will be glad to help.